Could Gen Z be the latest (and greatest) generation to land at your door? Before we get into Gen Z, a word about generations. The “Greatest Generation” – those who penny-pinched their way through the Great Depression – reside predominantly in history books, and in history books alone. Those Americans who followed, the so-called “Silent Generation” (born between 1925 and 1945), have long since retired from their jobs as dentists, doctors and beatnik poets, and are happily tending to their suburban lawns. That brings us to the Baby Boomers, whose numbers peaked in 1999, at the height of the first dot.com revolution. As shoppers, they’re foremost among the generations to value consumer loyalty, and to take their business personally. According to a recent report by Colloquy, Boomers are the ones “most likely to write off a retailer if a sales associate [doesn’t] appreciate their business, if a store [is] messy and if returns [are] a hassle.” In-store retailers, watch your backs. Next come the Gen Xers – and here we begin edging into familiar territory. Hobbies include dancing secretly at home to ‘90s pop songs and paying off enormous sums of debt accumulated during the Great Recession (while Gen Xers tend to earn more than their parents, they also tend to owe more, according to Pew Research). What blog-piece nowadays would be complete without mentioning millennials? Often (unfairly) characterized as overtly self-absorbed, more recent - and more thorough - studies suggest that millennials are demonstrably civic-minded, so long as they’re able to retain their independence and mobility. Unlike previous generations of workaholics, millennials strive to maintain a healthy balance between work and personal time, with varying degrees of success. If that means that they have to work 200-percent hard in order to play 100-percent hard, then so be it. Which leaves us with Generation Z. It took us several generations to get there, but we’ve finally reached the end of the alphabet. Does that mean we’re at the end of the world as we know it? Hardly. But we are dealing with a hybrid generation that combines futuristic technological savvy with a system of values that hasn’t been seen in American culture since… way back. To be sure, Gen Zers are a brand-new generation unto themselves. Born between 1995 and 2010, they’re the first true “digital natives”, having spent their entire lives in the burgeoning presence of the internet and the mobile app store. No other generation knows how to communicate quite as well through images on social media or how to apply ad-blocking as fast and as furiously when disrupted by online advertising. They’re also the first generation in a long while that doesn’t necessarily wind down each day in front of a television screen. For a member of Gen Z, that “screen” might just as easily be a tablet, a mobile phone or a Roku box. But in other ways, Gen Zers are, without themselves necessarily knowing it, throwbacks to a time in America that’s almost ancient history. Indeed, they share many of the same habits and qualities as the “Greatest Generation.” Don’t believe it? Have a look here and see for yourself. Surveys consistently indicate that today’s young people embody “old-timey” values like personal responsibility, a strong entrepreneurial work ethic, self-sufficiency, an intense preference of quality over quantity and an affable appreciation for spending time with friends and family. Like their “Greatest Generation” forebears, they seem to have a quintessential knack for encountering and defeating hardship on their own terms. In short, we all might stand to learn a few lessons from them – and that includes you, dear marketer. Especially given the fact that Gen Z will account for 40 percent of America’s population by 2020. Oh, and did we mention? They already have an estimated $143 billion in purchasing power - make that $829 billion if you include what families spend on them. Gen Z demonstrates the grit and resourcefulness of earlier generations far removed from them. While they didn’t experience the Great Depression, they did watch their parents scrimp and save their way through the Great Recession of 2008, and they share an intrinsic desire for value. Like the Boomers, they want streamlined shopping experiences and convenience - albeit with a twist. Whereas Boomers want an organized store and a clear return policy, Gen Zers expect brands to engage them how, when and where they want them to. When it comes to Gen X, we’re not sure what the link is - but they do seem to share a love for 90s fashion. Millennials, as the precursors to Gen Z, share more than a few similar traits (their tech savviness, their restlessness, and their independent streak) - but not all. Marketers need to be careful about preparing a clearly defined, Gen-Z-specific strategy, rather than assuming that just because it works with millennials, it will play well with Gen Zers, too. With Gen Z, it’s not just about creating a cool app with the requisite online ads. It’s more about reaching them where they already live (and tap). Instead, look to enhance your brand experience in aggregator apps that they’re already using, such as Seamless, Grubhub, and UNiDAYS. Word to the wise: Gen Z is notorious for deleting apps that are not useful to them and take up valuable space that might otherwise go to photos and videos. Gen Z Insights is presented by UNiDAYS, the world's leading Student Affinity Network. We help brands connect with over 10M Gen Z students around the globe, giving them the power to make every experience more valuable and rewarding. Do you have what it takes to connect with a generation who lives and breathes the Internet? Now you will! 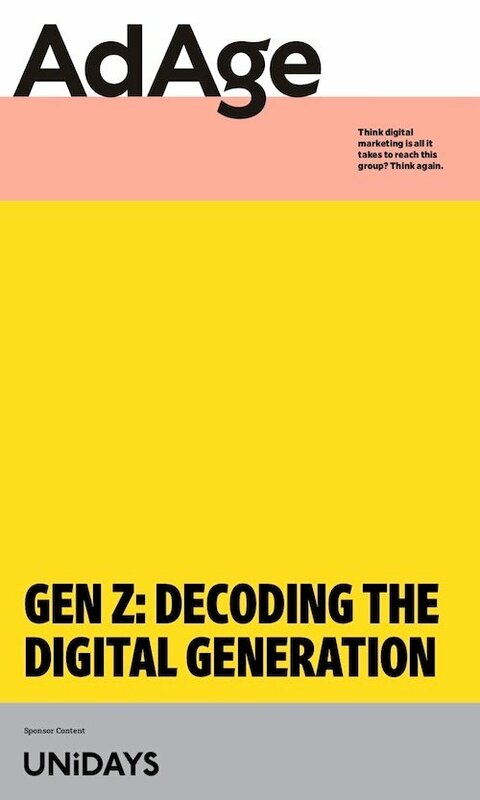 Download this powerful report, and you’ll find five mind-blowing myths to change the way you market to Gen Z forever.